A 1940's Recipe book with pictures, information, tips and good ideas for when you need to make the most of the rations you have.. Written By Marguerite Patten O.B.E. Our 1940's Society meetings are always friendly affairs with tea and biscuits a must. From time to time I give everyone a treat by baking a cake to a 1940's recipe. One of my favorites (and Ian's) is the 'Apple Fruit Cake' which is always guaranteed to disappear within minutes. This and many other favorites are found within this book. Despite collecting Ministry of Food literature and recipes I do have a number of books on wartime cooking. 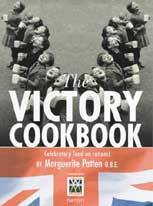 One of the best of these modern books is the Victory Cookbook by Marguerite Patten O.B.E. For those interested in 1940s cooking this book really is a must. A superb collection of recipes, photographs, information and tips from the Ministry of Food on how to make the most of meager rations. Marguerite Patten worked for the Ministry of Food during the war, demonstrating recipes and showing housewives how to utilise rations. She still gives talks around the country about recipes and life during the war years and is often seen on television. The book contains an assortment of recipes which are fun to try out. People are often surprised when they realise that it is a wartime recipe they are eating. In an age when many peoples cooking consists of throwing a premade pack into the microwave its a great way to find something different.